Sometimes I think I learn more about music, or writing, or any other kind of art only by putting it in the context or terms of another. When poetry is reinterpreted in a song, when a painting inspires a novel, or any other way of transforming art, you really get to see it differently. I’ve been fascinated by word-clouds since I came across the concept years ago. Take a bunch of text and plop it into a nifty generator and you get a visual representation of what words are repeated most often. Sometimes it reveals trends, like the ones that people make using famous speeches to find themes or political buzzwords. But it always reveals the heart of what is behind the art. There are some beautiful word-clouds out there for Rev. Dr. Martin Luther King Jr.’s “I Have A Dream” speech, or a very neat one in an appropriate shape for “The Raven” by Edgar Allen Poe. When you glance at these, you can see the words that carry the most weight, the words that are repeated, emphasized, and without which the piece loses all meaning. It’s also something of a gut-check, I think. If you write a poem you intend to be about love and find out that you use the word “salad” the most often, unless a salad is your central metaphor, it’s possible you missed your subject matter. Sometimes I grab the song lyrics of an album I’ve been keeping on repeat and feed them into an online word-cloud just to see what comes out. Do I notice that I’ve been feeling down lately and the core words which are most prominent are less than hopeful? Have I totally missed that half the songs on this one CD are actually about otters? It’s a neat way to see what you might have missed. So I decided to do one for Candles Enough. 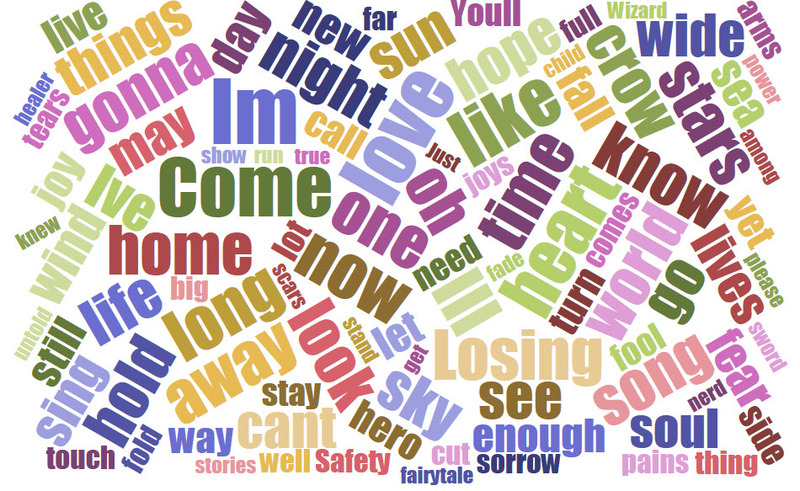 I pulled 13 of our songs and stuffed them into a free, online word-cloud courtesy of https://www.jasondavies.com/wordcloud/. How you interpret it is up to you, I guess. As for me? I see a lot of love, a lot of welcome, a lot of joy and hope. Which means I guess we’re doing something right with our songwriting!